Many of the best things to do in Sukhothai can be enjoyed self-guided over the span of a couple days; just grab a bicycle and go! Situated roughly halfway between Bangkok and Chiang Mai, Thailand’s ancient capital from the 13th century earned UNESCO World Heritage status in 1991. In contrast to Ayutthaya, another of Thailand’s ancient capitals, Sukhothai has a more compact feel and is often less crowded. The distance from Bangkok deters some travelers who instead opt to make the shorter, two-hour journey to explore Ayutthaya’s ruins, however both cities are worth a visit. Sukhothai is older than Ayutthaya, making the surviving ruins there all the more impressive. The Thai system of writing was developed in the Sukhothai Kingdom in 1283. The modern alphabet still looks much like the original stone inscriptions found on ruins around the park! Yes, opting to spend time indoors under fluorescent lighting isn’t easy when so many archaeological treats are waiting in the Sukhothai Historical Park, but learning a little of the history of Sukhothai will greatly enhance your experience there. Without a bit of understanding, all the Buddha statues and restored sites will blur into one big archaeological mess. You should get to the museum soon after arriving in Sukhothai. If time is short, perhaps consider exploring the ruins filling the Historical Park in the morning (the best time to do so, anyway) then hide from the day's heat in the museum. The time spent in the museum will help you understand what you’ve seen that morning. After it closes in late afternoon, go back to exploring temples and choose a good spot for sunset. The Ramkhamhaen National Museum is open until 4 p.m. The entry fee is 150 baht and you’ll need to leave your backpack in a locker. Although you can definitely explore the historical zones by foot, having a bicycle greatly increases your range. Many guesthouses will lend bicycles to guests for free. If not, rent one from the shops near the main entrance to the Sukhothai Historical Park. The bikes may have seen better days, but rentals are inexpensive (40-50 baht per day). A bicycle will allow you to see fringe sites without the added responsibility that comes with driving and parking a scooter. If you haven’t ridden a bicycle in decades, or feel like being lazy in the heat, jump on the electric tram that circulates the park. Guided tours are only 60 baht. If you thoroughly enjoyed the Ramkhamhaen National Museum, or maybe need a place to duck inside during the rainy season, the Sangkhalok Museum is another good choice. As with the Ramkhamhaen National Museum, a visit to the Sangkhalok Museum will expand your understanding of the many ruins in the area. The museum is home to a large collection of ancient ceramics — a must for anyone interested in pottery. Admission is around 100 baht. Considered the most important temple in Sukhothai, the “Temple of the Great Relic” is thought to have housed relics from Buddha. Wat Mahathat was constructed between 1292 and 1347; it served as the primary temple for the Sukhothai Kingdom. Wat Mahathat is the biggest and most visited of all the temple ruins in Sukhothai. Arrive either early or late in the day — doing so will help you avoid most of the tour groups that descend upon the temple. You may also catch a break when they go for lunch. Note: The name “Wat Mahathat” is used for several temples throughout Thailand, including a popular temple in Ayutthaya. Wat Si Chum is one of those sites that brings out the inner Indiana Jones, much like some of the vine-entangled temples of Angkor Wat, Cambodia. Second only to Wat Mahathat in popularity, Wat Si Chum is very photogenic. The real allure of Wat Si Chum is glimpsing the 50-foot-tall Buddha statue through an equally tall slit at the entrance. The fingers pointing downward have been rubbed with gold. Engraved slates along a corridor depict the life of Buddha. These works of art are considered to be the oldest examples of Thai drawing. As with Wat Mahathat, visiting early and beating the tour groups is essential for capturing the magic — and good photos — of Wat Si Chum. Chang means “elephant” in Thai, and that’s exactly what you’ll see at this beautifully restored temple. The 32 stone elephants that encircle the bell-shaped stupa stand at attention. Wat Chang Lom is a little outside the usual temple circuit. Find it behind the legendary Sukhothai Hotel and once you've gotten your fill of the temple there're plenty eating and shopping opportunities nearby. Note: There is another Wat Chang Lom an hour north of Sukhothai. If you’ve hired a driver, make sure they understand which one you wish to visit! Wat Si Sawai is different from the rest of the temples in Sukhothai because it was originally a Hindu shrine. It’s also one of the oldest temples there. Anyone who has already visited Angkor Wat will immediately notice the distinctive, Khmer-style architecture inside the moat. Numerous statues of Hindu deities have been found in the area and are now on display in the national museum. Wat Si Sawai was converted to a Buddhist temple sometime in the 14th century. Wat Sa Si is small when compared to the other temples around the historical park, but the serene setting makes up for the size. The temple is surrounded by water and and makes for beautiful sunset photos. With some luck and good lighting, you can get photos with the reds and oranges reflected in the temple lake. The stupa at Wat Sa Si is round with a point on top, the same style seen throughout Sri Lanka. The chedi is said to house the ashes of a former king of Sukhothai. Remember: The temple ruins are considered sacred places and are often visited by monks. The usual ways to show respect in temples apply. The Si Satchanalai Historical Park is about an hour's drive north of Sukhothai. 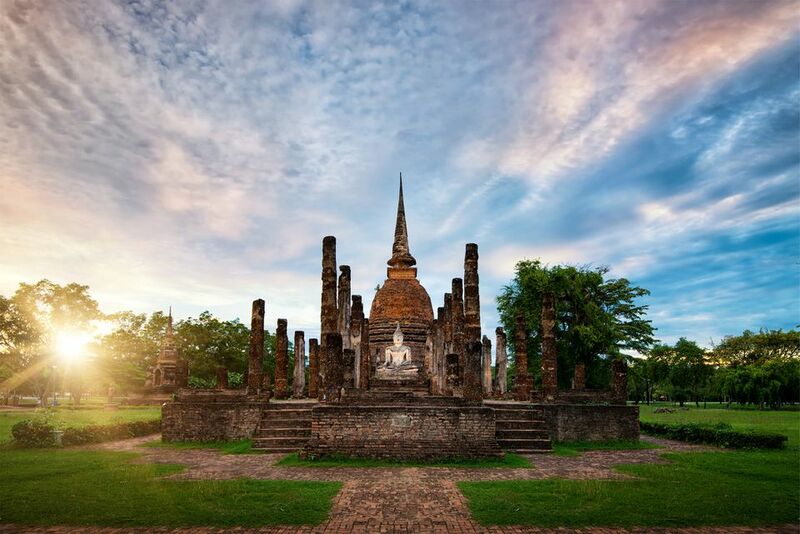 Established in 1250, the ruins of the “City of Good People” is like a miniature Sukhothai Historical Park. You’ll find impressive temples, Buddha statues, and the remains of city defenses meant to keep out Burmese invaders. The temple ruins are every bit as impressive as the ones in the Sukhothai Historical Park. Si Satchanalai is easily explored on foot and is a worthy UNESCO World Heritage Site to visit. If you’ve already explored enough temples to experience “wat burnout,” consider driving north to the remains of the Thuriang Kilns. The dozens of ancient ceramic kilns weren’t discovered until the end of the 20th century. Many kilns are protected from the elements with roofs, making the site a good choice for getting out of the sun or rain for a short while. The nearly 15-foot-long kilns once cranked out ceramic bricks and pottery at the peak of the Sukhothai Kingdom. Find the Thuriang Kilns just a little north of Si Satchanalai. You’ll need to hire a driver or rent a scooter. The best way to find the pulse of any new place is to spend time in the markets. Sukhothai has several; try to enjoy an authentic, inexpensive meal in either the night market or the early morning fresh market. The night market in Sukhothai is just busy enough to be exciting. You’ll usually see more Thais nibbling and socializing than tourists. Centralized seating (uncovered) allows travelers to socialize and enjoy tasty treats. The morning market in Sukhothai is excellent for people watching and sampling the local vibe. Although many of the stalls specialize in raw ingredients for local households and restaurants, there are some opportunities to try local fare. Grab some sticky rice, typically eaten with the fingers; use your right hand to be polite. Keep an eye out for fresh fruit (look for mangosteens when in season) and fried meats wrapped in banana leaves. Sukhothai has its own variant of Southeast Asia’s ubiquitous kuay tiew noodle soup. The Sukhothai version can be difficult to find elsewhere. Following a centuries-old recipe, rice noodles are added to a bone broth with thinly sliced pork, ground peanuts, bean sprouts and sliced vegetables. Some enhancements to offset the slight sweetness of the broth include lime juice and salty nam pla (fish sauce).